Catechin /ˈkætᵻtʃɪn/ is a flavan-3-ol, a type of natural phenol and antioxidant. It is a plant secondary metabolite. It belongs to the group of flavan-3-ols (or simply flavanols), part of the chemical family of flavonoids. The name of the catechin chemical family derives from catechu, which is the tannic juice or boiled extract of Mimosa catechu (Acacia catechu L.f). Catechin possesses two benzene rings (called the A- and B-rings) and a dihydropyran heterocycle (the C-ring) with a hydroxyl group on carbon 3. The A ring is similar to a resorcinol moiety while the B ring is similar to a catechol moiety. There are two chiral centers on the molecule on carbons 2 and 3. Therefore, it has four diastereoisomers. Two of the isomers are in trans configuration and are called catechin and the other two are in cis configuration and are called epicatechin. The most common catechin isomer is the (+)-catechin. The other stereoisomer is (-)-catechin or ent-catechin. The most common epicatechin isomer is (-)-epicatechin (also known under the names L-epicatechin, epicatechol, (-)-epicatechol, l-acacatechin, l-epicatechol, epi-catechin, 2,3-cis-epicatechin or (2R,3R)-(-)-epicatechin). The different epimers can be distinguished using chiral column chromatography. Making reference to no particular isomer, the molecule can just be called catechin. Mixtures of the different enantiomers can be called (+/-)-catechin or DL-catechin and (+/-)-epicatechin or DL-epicatechin. Catechin and epicatechin are the building blocks of the proanthocyanidins, a type of condensed tannin. Moreover, the flexibility of the C-ring allows for two conformation isomers, putting the B ring either in a pseudoequatorial position (E conformer) or in a pseudoaxial position (A conformer). Studies confirmed that (+)-catechin adopts a mixture of A- and E-conformers in aqueous solution and their conformational equilibrium has been evaluated to be 33:67. As flavonoids, catechins can act as antioxidants when in high concentration in vitro, but compared with other flavonoids, their antioxidant potential is low. The ability to quench singlet oxygen seems to be in relation with the chemical structure of catechin, with the presence of the catechol moiety on ring B and the presence of a hydroxyl group activating the double bond on ring C.
Electrochemical experiments show that (+)-catechin oxidation mechanism proceeds in sequential steps, related with the catechol and resorcinol groups and the oxidation is pH-dependent. The oxidation of the catechol 3′,4′-dihydroxyl electron-donating groups occurs first, at very low positive potentials, and is a reversible reaction. The hydroxyl groups of the resorcinol moiety oxidised afterwards were shown to undergo an irreversible oxidation reaction. The laccase/ABTS system oxidizes (+)-catechin to oligomeric products of which proanthocyanidin A2 is a dimer. (+)-Catechin and (-)-epicatechin as well as their gallic acid conjugates are ubiquitous constituents of vascular plants, and frequent components of traditional herbal remedies, such as the Chinese medicine plant Uncaria rhynchophylla and others. The two isomers are mostly found as cacao and tea constituents. (-)-Epicatechin can be found in cacao beans and was first called kakaool or cacao-ol. It was isolated from green tea by Michiyo Tsujimura in 1929. Maximilian Nierenstein was among those who proved the presence of catechin in cocoa beans in 1931. Catechin is also found as glycoside  and the glycosidic form has also antioxidant properties "in vitro". The main dietary sources of catechins in Europe and the United States are tea and pome fruits. Catechins and epicatechins are found in cocoa, which, according to one database, has the highest content (108 mg/100 g) of catechins among foods analyzed, followed by prune juice (25 mg/100 ml) and broad bean pod (16 mg/100 g). Açaí oil, obtained from the fruit of the açaí palm (Euterpe oleracea), contains (+)-catechins (67 mg/kg). (-)-Epicatechin and (+)-catechin are among the main natural phenols in argan oil. Catechins are diverse among foods, from peaches to green tea and vinegar. Catechins are found in barley grain where they are the main phenolic compound responsible for dough discoloration. The taste associated with monomeric (+)-catechin or (-)-epicatechin is described as not exactly astringent, nor exactly bitter. Leucocyanidin reductase (LCR) uses 2,3-trans-3,4-cis-leucocyanidin to produce (+)-catechin and is the first enzyme in the proanthocyanidins (PA)-specific pathway. Its activity has been measured in leaves, flowers, and seeds of the legumes Medicago sativa, Lotus japonicus, Lotus uliginosus, Hedysarum sulfurescens, and Robinia pseudoacacia. The enzyme is also present in Vitis vinifera (grape). Catechin oxygenase, a key enzyme in the degradation of catechin, is present in fungi and bacteria. Among bacteria, degradation of (+)-catechin can be achieved by Acinetobacter calcoaceticus. Catechin is metabolized to protocatechuic acid (PCA) and phloroglucinol carboxylic acid (PGCA). It is also degraded by Bradyrhizobium japonicum. Phloroglucinol carboxylic acid is further decarboxylated to phloroglucinol, which is dehydroxylated to resorcinol. Resorcinol is hydroxylated to hydroxyquinol. Protocatechuic acid and hydroxyquinol undergo intradiol cleavage through protocatechuate 3,4-dioxygenase and hydroxyquinol 1,2-dioxygenase to form β-carboxy cis, cis-muconic acid and maleyl acetate. Among fungi, degradation of catechin can be achieved by Chaetomium cupreum. Schematic representation of (−)-epicatechin metabolism in humans as a function of time post-oral intake. 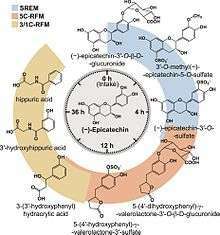 SREM: structurally related (−)-epicatechin metabolites. 5C-RFM: 5-carbon ring fission metabolites. 3/1C-RFM: 3- and 1-carbon-side chain ring fission metabolites. The structures of the most abundant (−)-epicatechin metabolites present in the systemic circulation and in urine are depicted. Catechins are metabolised upon uptake from the gastrointestinal tract, in particular the jejunum, and in the liver, resulting in so-called structurally-related epicatechin metabolites (SREM). The main metabolic pathways for SREMs are glucuronidation, sulphation and methylation of the catechol group by catechol-O-methyl transferase, with only small amounts detected in plasma. The majority of dietary catechins are however metabolised by the colonic microbiome to gamma-valerolactones and hippuric acids which undergo further biotransformation, glucuronidation, sulphation and methylation in the liver. The stereochemical configuration of catechins has a strong impact on their uptake and metabolism as uptake is highest for (-)-epicatechin and lowest for (-)-catechin. Plasma catechin metabolites are present as conjugated forms and mainly constituted by glucuronidated and sulphated derivatives. There are large inter-species differences in metabolism, making comparisons between data from rodents and humans difficult. The primary metabolite of (+)-catechin in rat plasma is a glucuronide in the nonmethylated form. In contrast, the primary metabolites of (-)-epicatechin in rat plasma are glucuronide and sulfoglucuronide in nonmethylated forms, and sulfate in the 3'-O-methylated forms (3'OMC). The recent use of radiocarbon-labeled epicatechin (14C2-(−)-epicatechin) demonstrated significant species-dependent differences in the metabolism of (-)-epicatechin in rat, mouse and human. In rats, the concentrations of catechin derivatives in the liver are lower than in plasma, and no accumulation is observed after adaptation for 14 days to the supplemented diets. The hepatic metabolites are intensively methylated (90–95%), but in contrast to plasma, some free aglycones can be detected. Rats fed with (+)-catechin and (-)-epicatechin exhibit (+)-catechin 5-O-β-glucuronide and (-)-epicatechin 5-O-β-glucuronide in their body fluids. Catechin is absorbed into intestinal cells and metabolized extensively because no native catechin can be detected in plasma from the mesenteric vein. Additional methylation and sulfation occur in the liver, and glucuronide or sulfate conjugates of 3'OMC are excreted extensively in bile. Circulating forms are mainly glucuronide conjugates of catechin and 3'OMC. Another study shows that catechin undergoes enzymatic oxidation by tyrosinase in the presence of glutathione (GSH) to form mono-, bi-, and tri-glutathione conjugates of catechin and mono- and bi-glutathione conjugates of a catechin dimer. In the crab-eating macaque (Macaca iris), (+)-catechin administered orally or intraperitonally leads to the formation of 10 metabolites and notably to m-hydroxyphenylhydracrylic acid excreted in the urine. Biotransformation of (+)-catechin into taxifolin by a two-step oxidation can be achieved by Burkholderia sp. (+)-Catechin and (-)-epicatechin are transformed by the endophytic filamentous fungus Diaporthe sp. 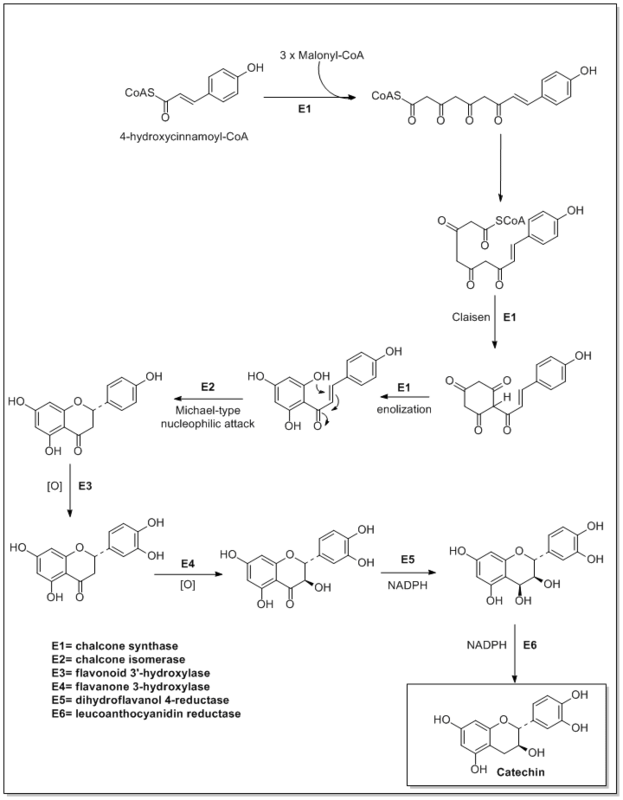 into the 3,4-cis-dihydroxyflavan derivatives, (+)-(2R,3S,4S)-3,4,5,7,3',4'-hexahydroxyflavan (leucocyanidin) and (-)-(2R,3R,4R)-3,4,5,7,3',4'-hexahydroxyflavan, respectively, whereas (-)-catechin and (+)-epicatechin with a 2S-phenyl group resisted the biooxidation. Leucoanthocyanidin reductase (LAR) uses (2R,3S)-catechin, NADP+ and H2O to produce 2,3-trans-3,4-cis-leucocyanidin, NADPH, and H+. Its gene expression has been studied in developing grape berries and grapevine leaves. (2R,3S)-Catechin-7-O-β-D-glucopyranoside can be isolated from barley (Hordeum vulgare L.) and malt. Epigeoside (Catechin-3-O-alpha-L-rhamnopyranosyl-(1-4)-beta-D-glucopyranosyl-(1-6)-beta-D-glucopyranoside) can be isolated from the rhizomes of Epigynum auritum. Association between flavan-3-ol intake and incidence of cardiovascular disease in different cohort studies. Data compare the bottom and top quintiles of intake. Centuries ago, catechin-containing extracts were thought to be useful for treating heart diseases, and an effect on the permeability of capillaries was shown in 1936. Limited evidence from dietary studies indicates that catechins may have an effect on endothelium-dependent vasodilation which could contribute to normal blood flow regulation in humans. Green tea catechins may improve blood pressure, especially when systolic blood pressure is above 130 mmHg. Due to extensive metabolism during digestion, the fate and activity of catechin metabolites responsible for this effect on blood vessels, as well as the actual mode of action, are unknown. The European Food Safety Authority established that cocoa flavanols have an effect on vascular function in healthy adults by concluding: "cocoa flavanols help maintain endothelium-dependent vasodilation, which contributes to normal blood flow". Data from observational cohort studies have not shown a consistent association between flavan-3-ol intake and risk of cardiovascuar diseases. A meta-analysis also indicated that green tea catechins may favorably affect cholesterol. Depending on dose consumed, catechins and their metabolites can bind to red blood cells and possibly induce release of autoantibodies, resulting in haemolytic anaemia and renal failure. This resulted in the withdrawal of the catechin-containing drug, Catergen, used to treat viral hepatitis from the European market in 1985. Catechins released into the ground by some plants may hinder the growth of their neighbors, a form of allelopathy. Centaurea maculosa, the spotted knapweed often studied for this behavior, releases catechin isomers into the ground through its roots, potentially having effects as an antibiotic or herbicide. One hypothesis is that it causes a reactive oxygen species wave through the target plant's root to kill root cells by apoptosis. Most plants in the European ecosystem have defenses against catechin, but few plants are protected against it in the North American ecosystem where Centaurea maculosa is an invasive, uncontrolled weed. Catechin acts as an infection-inhibiting factor in strawberry leaves. Epicatechin and catechin may prevent coffee berry disease by inhibiting appressorial melanization of Colletotrichum kahawae. ↑ "Cutch and catechu plant origin". Food and Agriculture Organization of the United Nations. 5 November 2011. ↑ Rinaldo D, Batista JM, Rodrigues J, et al. (August 2010). "Determination of catechin diastereomers from the leaves of Byrsonima species using chiral HPLC-PAD-CD". Chirality. 22 (8): 726–33. doi:10.1002/chir.20824. PMID 20143413. ↑ Kríz Z, Koca J, Imberty A, Charlot A, Auzély-Velty R (July 2003). "Investigation of the complexation of (+)-catechin by β-cyclodextrin by a combination of NMR, microcalorimetry and molecular modeling techniques". Org. Biomol. Chem. 1 (14): 2590–5. doi:10.1039/B302935M. PMID 12956082. ↑ Pietta, P. G. (2000). "Flavonoids as antioxidants". Journal of Natural Products. 63 (7): 1035–42. PMID 10924197. ↑ Tournaire C, Croux S, Maurette MT, et al. (August 1993). "Antioxidant activity of flavonoids: Efficiency of singlet oxygen (1Δg) quenching". J. Photochem. Photobiol. B, Biol. 19 (3): 205–15. doi:10.1016/1011-1344(93)87086-3. PMID 8229463. ↑ Janeiro, Patricia; Oliveira Brett, Ana Maria (2004). "Catechin electrochemical oxidation mechanisms". Analytica Chimica Acta. 518: 109–115. doi:10.1016/j.aca.2004.05.038. ↑ Osman, A.M.; Wong, K.K.Y. ; Fernyhough, A. (2007). "The laccase/ABTS system oxidizes (+)-catechin to oligomeric products". Enzyme and Microbial Technology. 40 (5): 1272–1279. doi:10.1016/j.enzmictec.2006.09.018. ↑ Lin, Yi-Pei; Chen, Tai-Yuan; Tseng, Hsiang-Wen; Lee, Mei-Hsien; Chen, Shui-Tein (2009). "Neural cell protective compounds isolated from Phoenix hanceana var. Formosana". Phytochemistry. 70 (9): 1173–81. doi:10.1016/j.phytochem.2009.06.006. PMID 19628235. ↑ Freudenberg, Karl; Cox, Richard F. B.; Braun, Emil (1932). "The Catechin of the Cacao Bean1". Journal of the American Chemical Society. 54 (5): 1913–1917. doi:10.1021/ja01344a026. ↑ "Michiyo Tsujimura (1888–1969)". Ochanomizu University. Retrieved 10 November 2015. ↑ Adam, W. B.; Hardy, F.; Nierenstein, M. (1931). "The Catechin of the Cacao Bean". Journal of the American Chemical Society. 53 (2): 727–728. doi:10.1021/ja01353a041. ↑ Chumbalov, T. K.; Pashinina, L. T.; Storozhenko, N. D. (1976). "Catechin 7-rhamnoside fromSpiraea hypericifolia". Chemistry of Natural Compounds. 12 (2): 232–233. doi:10.1007/BF00566356. ↑ Chun, O. K.; Chung, S. J.; Song, W. O. (2007). "Estimated dietary flavonoid intake and major food sources of U.S. Adults". The Journal of nutrition. 137 (5): 1244–52. PMID 17449588. ↑ Vogiatzoglou, A; Mulligan, A. A.; Lentjes, M. A.; Luben, R. N.; Spencer, J. P.; Schroeter, H; Khaw, K. T.; Kuhnle, G. G. (2015). "Flavonoid intake in European adults (18 to 64 years)". PLoS ONE. 10 (5): e0128132. doi:10.1371/journal.pone.0128132. PMC 4444122 . PMID 26010916. ↑ Kwik-Uribe C, Bektash RM (2008). "Cocoa flavanols - measurement, bioavailability and bioactivity" (PDF). Asia Pac J Clin Nutr. 17 (Suppl 1): 280–3. PMID 18296356. 1 2 3 "Polyphenols in green tea infusion". Phenol-Explorer, v 3.5. 2014. Retrieved 1 November 2014. ↑ Pacheco-Palencia LA, Mertens-Talcott S, Talcott ST (June 2008). "Chemical composition, antioxidant properties, and thermal stability of a phytochemical enriched oil from Acai (Euterpe oleracea Mart.)". J. Agric. Food Chem. 56 (12): 4631–6. doi:10.1021/jf800161u. PMID 18522407. ↑ ., Z. Charrouf; ., D. Guillaume (2007). "Phenols and Polyphenols from Argania spinosa". American Journal of Food Technology. 2 (7): 679–683. doi:10.3923/ajft.2007.679.683. ↑ Cheng, Guiwen W.; Crisosto, Carlos H. (1995). "Browning Potential, Phenolic Composition, and Polyphenoloxidase Activity of Buffer Extracts of Peach and Nectarine Skin Tissue" (PDF). J. Amer. Soc. Hort. Sci. 120 (5): 835–838. ↑ Gálvez, Miguel Carrero; Barroso, Carmelo García; Pérez-Bustamante, Juan Antonio (1994). "Analysis of polyphenolic compounds of different vinegar samples". Zeitschrift für Lebensmittel-Untersuchung und -Forschung. 199 (1): 29–31. doi:10.1007/BF01192948. ↑ Quinde-Axtell, Zory; Baik, Byung-Kee (2006). "Phenolic Compounds of Barley Grain and Their Implication in Food Product Discoloration". J. Agric. Food Chem. 54 (26): 9978–9984. doi:10.1021/jf060974w. PMID 17177530. ↑ Kielhorn, S; Thorngate Iii, J.H (1999). "Oral sensations associated with the flavan-3-ols (+)-catechin and (−)-epicatechin". Food Quality and Preference. 10 (2): 109–116. doi:10.1016/S0950-3293(98)00049-4. ↑ Rani, Arti; Singh, Kashmir; Ahuja, Paramvir S.; Kumar, Sanjay (2012). "Molecular regulation of catechins biosynthesis in tea \Camellia sinensis (L.) O. Kuntze]". Gene. 495 (2): 205–10. doi:10.1016/j.gene.2011.12.029. PMID 22226811. ↑ Punyasiri, P.A.N. ; Abeysinghe, I.S.B. ; Kumar, V.; Treutter, D.; Duy, D.; Gosch, C.; Martens, S.; Forkmann, G.; Fischer, T.C. (2004). "Flavonoid biosynthesis in the tea plant Camellia sinensis: Properties of enzymes of the prominent epicatechin and catechin pathways". Archives of Biochemistry and Biophysics. 431 (1): 22–30. doi:10.1016/j.abb.2004.08.003. PMID 15464723. ↑ Dewick, Paul M. (2009). Medicinal Natural Products: A Biosynthetic Approach (3rd ed.). UK: John Wiley & Sons. ISBN 978-0-470-74167-2. ↑ Skadhauge, Birgitte; Gruber, Margaret Y.; Thomsen, Karl Kristian; Von Wettstein, Diter (April 1997). "Leucocyanidin Reductase Activity and Accumulation of Proanthocyanidins in Developing Legume Tissues". American Journal of Botany. 84 (4): 494–503. doi:10.2307/2446026. JSTOR 2446026. ↑ Maugé C, Granier T, d'Estaintot BL, et al. (April 2010). "Crystal structure and catalytic mechanism of leucoanthocyanidin reductase from Vitis vinifera". J. Mol. Biol. 397 (4): 1079–91. doi:10.1016/j.jmb.2010.02.002. PMID 20138891. ↑ Arunachalam, M; Mohan, N; Sugadev, R; Chellappan, P; Mahadevan, A (2003). "Degradation of (+)-catechin by Acinetobacter calcoaceticus MTC 127". Biochimica et Biophysica Acta (BBA) - General Subjects. 1621 (3): 261–265. doi:10.1016/S0304-4165(03)00077-1. ↑ Hopper, Waheeta; Mahadevan, A. (1997). "Degradation of catechin by Bradyrhizobium japonicum". Biodegradation. 8 (3): 159–165. doi:10.1023/A:1008254812074. ↑ Sambandam, T.; Mahadevan, A. (1993). "Degradation of catechin and purification and partial characterization of catechin oxygenase fromChaetomium cupreum". World Journal of Microbiology & Biotechnology. 9: 37–44. doi:10.1007/BF00656513. 1 2 3 4 5 Ottaviani, J. I.; Borges, G; Momma, T. Y.; Spencer, J. P.; Keen, C. L.; Crozier, A; Schroeter, H (2016). "The metabolome of 2-(14)C(-)-epicatechin in humans: Implications for the assessment of efficacy, safety, and mechanisms of action of polyphenolic bioactives". Scientific Reports. 6: 29034. doi:10.1038/srep29034. PMC 4929566 . PMID 27363516. ↑ Actis-Goretta, L; Lévèques, A; Rein, M; Teml, A; Schäfer, C; Hofmann, U; Li, H; Schwab, M; Eichelbaum, M; Williamson, G (2013). "Intestinal absorption, metabolism, and excretion of (-)-epicatechin in healthy humans assessed by using an intestinal perfusion technique". American Journal of Clinical Nutrition. 98 (4): 924–33. doi:10.3945/ajcn.113.065789. PMID 23864538. ↑ Ottaviani, J. I.; Momma, T. Y.; Kuhnle, G. K.; Keen, C. L.; Schroeter, H (2012). "Structurally related (-)-epicatechin metabolites in humans: Assessment using de novo chemically synthesized authentic standards". Free Radical Biology and Medicine. 52 (8): 1403–12. doi:10.1016/j.freeradbiomed.2011.12.010. PMID 22240152. 1 2 3 4 "Flavonoids". Linus Pauling Institute, Oregon State University, Corvallis. 2016. Retrieved 24 July 2016. ↑ Ottaviani, J. I.; Momma, T. Y.; Heiss, C; Kwik-Uribe, C; Schroeter, H; Keen, C. L. (2011). "The stereochemical configuration of flavanols influences the level and metabolism of flavanols in humans and their biological activity in vivo". Free Radical Biology and Medicine. 50 (2): 237–44. doi:10.1016/j.freeradbiomed.2010.11.005. PMID 21074608. ↑ Baba S, Osakabe N, Natsume M, Muto Y, Takizawa T, Terao J (November 2001). "In vivo comparison of the bioavailability of (+)-catechin, (-)-epicatechin and their mixture in orally administered rats". J. Nutr. 131 (11): 2885–91. PMID 11694613. ↑ Manach, Claudine; Texier, Odile; Morand, Christine; Crespy, Vanessa; Régérat, Françoise; Demigné, Christian; Rémésy, Christian (1999). "Comparison of the bioavailability of quercetin and catechin in rats". Free Radical Biology and Medicine. 27 (11–12): 1259–66. doi:10.1016/S0891-5849(99)00159-8. PMID 10641719. ↑ Harada M, Kan Y, Naoki H, et al. (June 1999). "Identification of the major antioxidative metabolites in biological fluids of the rat with ingested (+)-catechin and (-)-epicatechin". Biosci. Biotechnol. Biochem. 63 (6): 973–7. doi:10.1271/bbb.63.973. PMID 10427682. ↑ Donovan JL, Crespy V, Manach C, et al. (June 2001). "Catechin is metabolized by both the small intestine and liver of rats". J. Nutr. 131 (6): 1753–7. PMID 11385063. ↑ Moridani MY, Scobie H, Salehi P, O'Brien PJ (July 2001). "Catechin metabolism: glutathione conjugate formation catalyzed by tyrosinase, peroxidase, and cytochrome p450". Chem. Res. Toxicol. 14 (7): 841–8. doi:10.1021/tx000235o. PMID 11453730. ↑ Das NP (1974). "Studies on flavonoid metabolism. Excretion of m-hydroxyphenylhydracrylic acid from (plus)-catechin in the monkey (Macaca iris sp.)". Drug Metab. Dispos. 2 (3): 209–13. PMID 4153081. ↑ Matsuda M, Otsuka Y, Jin S, et al. (February 2008). "Biotransformation of (+)-catechin into taxifolin by a two-step oxidation: primary stage of (+)-catechin metabolism by a novel (+)-catechin-degrading bacteria, Burkholderia sp. KTC-1, isolated from tropical peat". Biochem. Biophys. Res. Commun. 366 (2): 414–9. doi:10.1016/j.bbrc.2007.11.157. PMID 18068670. ↑ Shibuya H, Agusta A, Ohashi K, Maehara S, Simanjuntak P (July 2005). "Biooxidation of (+)-catechin and (-)-epicatechin into 3,4-dihydroxyflavan derivatives by the endophytic fungus Diaporthe sp. isolated from a tea plant". Chem. Pharm. Bull. 53 (7): 866–7. doi:10.1248/cpb.53.866. PMID 15997157. ↑ Bogs J, Downey MO, Harvey JS, Ashton AR, Tanner GJ, Robinson SP (October 2005). "Proanthocyanidin synthesis and expression of genes encoding leucoanthocyanidin reductase and anthocyanidin reductase in developing grape berries and grapevine leaves". Plant Physiol. 139 (2): 652–63. doi:10.1104/pp.105.064238. JSTOR 4281902. PMC 1255985 . PMID 16169968. ↑ Friedrich, Wolfgang; Galensa, Rudolf (2002). "Identification of a new flavanol glucoside from barley ( Hordeum vulgare L.) and malt". European Food Research and Technology. 214 (5): 388–393. doi:10.1007/s00217-002-0498-x. ↑ Jin QD, Mu QZ (1991). "[Study on glycosidal constituents from Epigynum auritum]". Yao Xue Xue Bao (in Chinese). 26 (11): 841–5. PMID 1823978. 1 2 Vogiatzoglou, A; Mulligan, A. A.; Bhaniani, A; Lentjes, M. A.; McTaggart, A; Luben, R. N.; Heiss, C; Kelm, M; Merx, M. W.; Spencer, J. P.; Schroeter, H; Khaw, K. T.; Kuhnle, G. G. (2015). "Associations between flavan-3-ol intake and CVD risk in the Norfolk cohort of the European Prospective Investigation into Cancer (EPIC-Norfolk)". Free Radical Biology and Medicine. 84: 1–10. doi:10.1016/j.freeradbiomed.2015.03.005. PMC 4503814 . PMID 25795512. ↑ Schroeder, Johann (1655). Pharmacopoeia medico-chymica: sive thesaurus pharmacologeus. Ulmae Suevorum: Johannis Gerlini. ↑ Berends, KAW (1829). Handbuch der praktischen Arzneiwissenschaft oder der speziellen Pathologie und Therapie. Berlin: Enslin. ↑ Hooper, L; Kay, C; Abdelhamid, A; Kroon, P. A.; Cohn, J. S.; Rimm, E. B.; Cassidy, A (2012). "Effects of chocolate, cocoa, and flavan-3-ols on cardiovascular health: A systematic review and meta-analysis of randomized trials". American Journal of Clinical Nutrition. 95 (3): 740–51. doi:10.3945/ajcn.111.023457. PMID 22301923. ↑ Ellinger, S; Reusch, A; Stehle, P; Helfrich, H. P. (2012). "Epicatechin ingested via cocoa products reduces blood pressure in humans: A nonlinear regression model with a Bayesian approach". American Journal of Clinical Nutrition. 95 (6): 1365–77. doi:10.3945/ajcn.111.029330. PMID 22552030. 1 2 Khalesi, S; Sun, J; Buys, N; Jamshidi, A; Nikbakht-Nasrabadi, E; Khosravi-Boroujeni, H (2014). 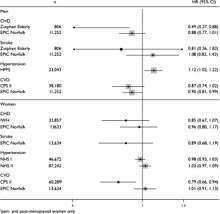 "Green tea catechins and blood pressure: A systematic review and meta-analysis of randomised controlled trials". European Journal of Nutrition. 53 (6): 1299–311. doi:10.1007/s00394-014-0720-1. PMID 24861099. ↑ Schroeter, H; Heiss, C; Balzer, J; Kleinbongard, P; Keen, C. L.; Hollenberg, N. K.; Sies, H; Kwik-Uribe, C; Schmitz, H. H.; Kelm, M (2006). "(-)-Epicatechin mediates beneficial effects of flavanol-rich cocoa on vascular function in humans". Proceedings of the National Academy of Sciences. 103 (4): 1024–9. doi:10.1073/pnas.0510168103. PMC 1327732 . PMID 16418281. ↑ EFSA Panel on Dietetic Products, Nutrition and Allergies (NDA) (2012). "Scientific opinion on the substantiation of a health claim related to cocoa flavanols and maintenance of normal endothelium-dependent vasodilation pursuant to Article 13(5) of Regulation (EC) No 1924/2006". EFSA Journal. Wiley. 10 (7): 2809. doi:10.2903/j.efsa.2012.2809. Retrieved 25 July 2016. ↑ Martinez SE; Davies NM; Reynolds JK (2013). "Toxicology and Safety of Flavonoids". Methods of Analysis, Preclinical and Clinical Pharmacokinetics, Safety, and Toxicology. John Wiley & Son. p. 257. ISBN 978-0-470-57871-1. ↑ Bode, JC (1987). Assessment and Management of Hepatobiliary Disease. Berlin: Springer-Verlag. p. 371. doi:10.1007/978-3-642-72631-6. ISBN 978-3-642-72631-6. ↑ "Ruhen der Zulassung für Catergen" (PDF). Deutsches Ärzteblatt. 82 (38): 2706. 1 2 Amanda K. Broz and Jorge M. Vivanco (2006). "Secondary Metabolites and Allelopathy in Plant Invasions: A Case Study of Centaurea maculosa". Sinauer Associates; Plant Physiology and Development, Ed. 6; Lincoln Taiz, Eduardo Zeiger, Ian M. Møller, and Angus Murphy, editors. ↑ Bais HP, Vepachedu R, Gilroy S, Callaway RM, Vivanco JM (September 2003). "Allelopathy and exotic plant invasion: from molecules and genes to species interactions". Science. 301 (5638): 1377–80. doi:10.1126/science.1083245. PMID 12958360. ↑ Yamamoto M, Nakatsuka S, Otani H, Kohmoto K, Nishimura S (June 2000). "(+)-catechin acts as an infection-inhibiting factor in strawberry leaf". Phytopathology. 90 (6): 595–600. doi:10.1094/PHYTO.2000.90.6.595. PMID 18944538. ↑ Chen Z, Liang J, Zhang C, Rodrigues CJ (October 2006). "Epicatechin and catechin may prevent coffee berry disease by inhibition of appressorial melanization of Colletotrichum kahawae". Biotechnol. Lett. 28 (20): 1637–40. doi:10.1007/s10529-006-9135-2. PMID 16955359. Look up Catechin or catechine in Wiktionary, the free dictionary.